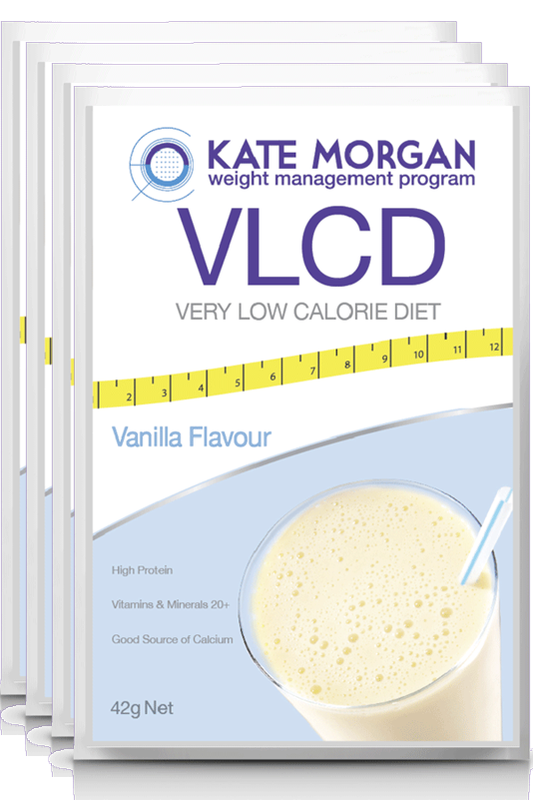 Kate Morgan Very Low Calorie Diet Shake sachets are heavily fortified with vitamins and minerals that your body needs while you lose weight. They are part of a nutritionally balanced weight loss program and taste great. Contents of one sachet replaces one meal. Milk Solids, Fructose, Dietary Fibre (Inulin), Minerals (Calcium, Potassium, Chloride, Magnesium, Phosphorus, Iron, Zinc, Manganese, Copper, Molybdenum, Iodine, Chromium, Selenium), Vitamins (C, B3 E, B5, B6, B2, B1, A, Folate, Biotin, K, D, B12), Natural Flavour, Vegetable Gum (415), Salt, Sweetener (955).